Bargarh, a town situated in western part of Odisha is widely acknowledged as the rice bowl of the state. The town is of historical importance because of its contribution to India’s struggle to achieve Independence. 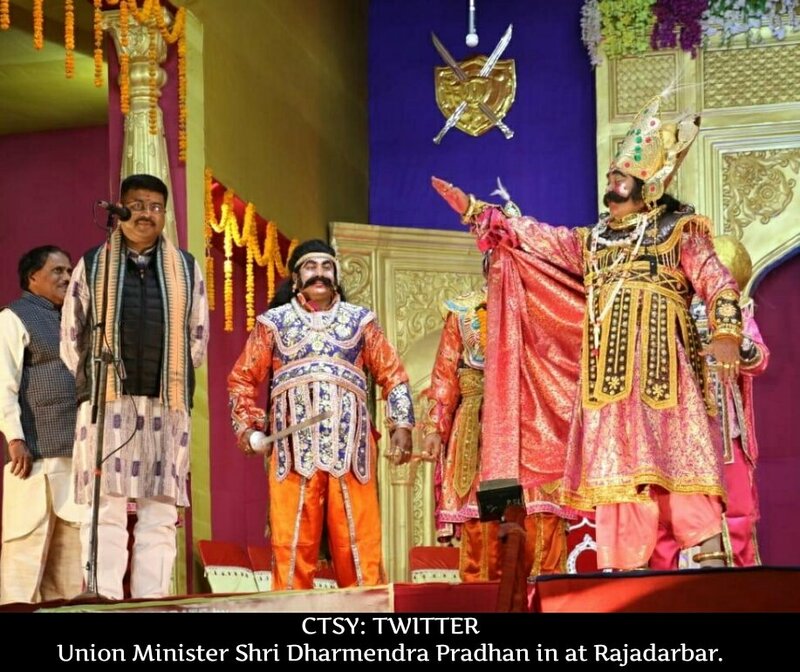 And Bargarh is unique in the fact that it hosts world’s largest open air theatre, which is known as the ‘Dhanu Yatra’. Dhanu Yatra is the tale of Lord Krishna and his maternal uncle Kansa. The tale starts from the birth of Lord Krishna (who is the son of Kansa’s sister) till he goes on to vanquish Kansa. The source material of the drama traces its roots to the ‘Harivamsa Purana’, an ancient scripture which chronicles the early life and times of Lord Krishna. Composed by Acharya Jinasena in 783 AD, Harivamsa Purana is divided into 66 cantos containing over 12,000 shlokas. Majestically seated on a bedecked elephant, the colourfully attired Bhubaneswar Pradhan, nicknamed Bhubana, often breaks into hysterical laughter and yells at passers by while twirling a moustache that seems to get bushier each year. 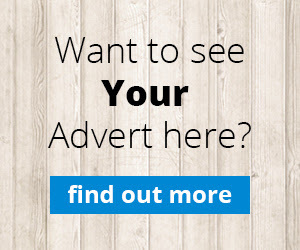 Bhubana, a tent house supplier by profession, loves putting on this new persona. Six kilometres away from his court is the village of Ambapalli, considered the mythical Gopapur, on the banks of the River Jeera, which in turn is given the role of River Yamuna. Ayush and Asutosh, two school boys, who act out the roles of Krishna and Balaram, respectively, crack jokes and play childhood pranks in Ambapalli. What sets the event strikingly apart from other mythological plays is its grace and grandeur that is taken to new levels by the synchronised participation of hundreds of invisible artists in multiple locations. The ordinary people of Bargarh make themselves available to be ‘ruled’ by the tyrannical king while residents of Ambapalli deem themselves citizens of the mythological place, Gopapur, and shower their love on the child gods, Krishna and Balaram. 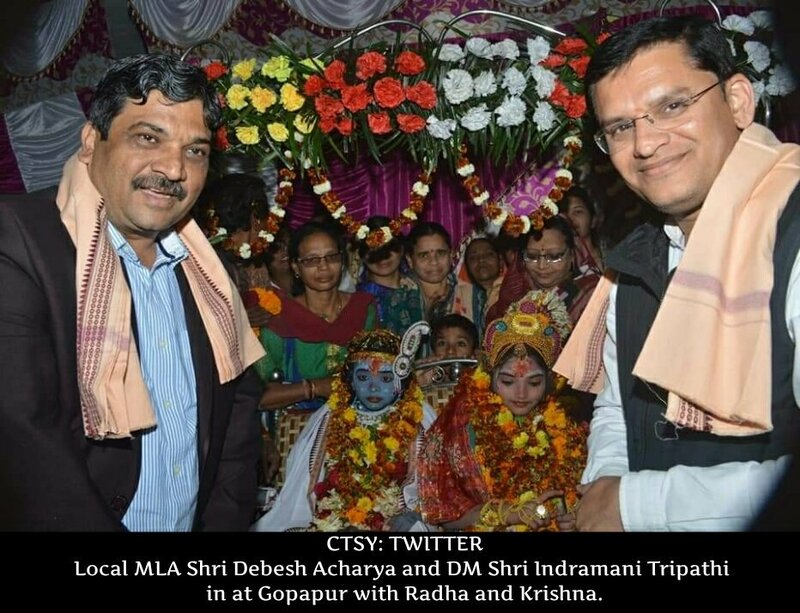 The residents of Bargarh don’t eat meat for the 11 days during the festival and every household washes the feet of Krishna and Balaram and pays obeisance to the gods who are believed to have incarnated in the form of Krishna and Balaram. 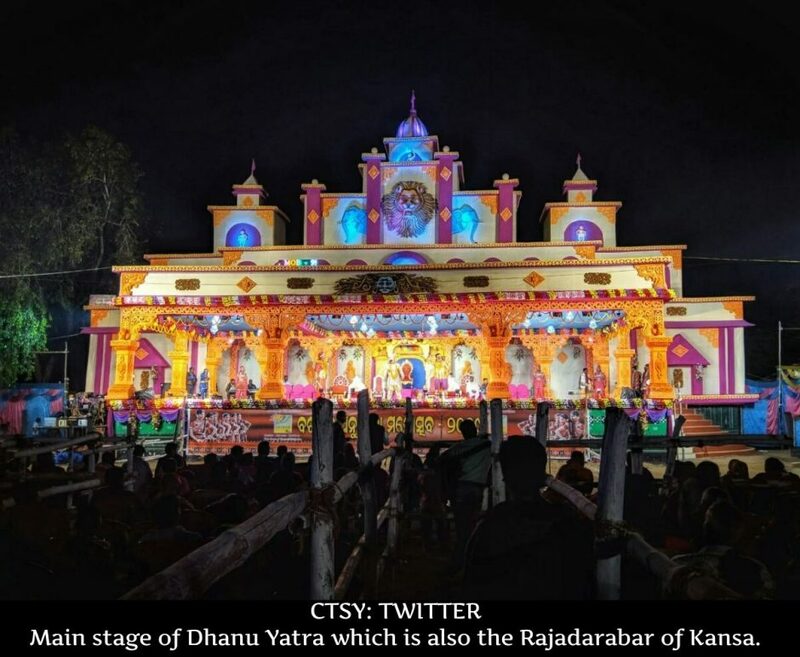 According to legend, the Dhanu Yatra was first conceptualised about 150 years ago when some devotees of Krishna of Bargarh found similarities in the geographical area of Bargarh, Ambapali and River Jeera with Mathura, Gopa, Brindavan and River Yamuna. But an organised Dhanu Yatra festival began only in 1948. Traditionally, the yatra is celebrated for 11 days from the fifth day of the bright fortnight till the full moon day inthe month of Sagittarius (Dhanu or Pausa) of every Hindu calendar year. Theplay begins with Kansa’s accession to the throne followed by the wedding of King Kansa’s sister Devaki with Basudev. 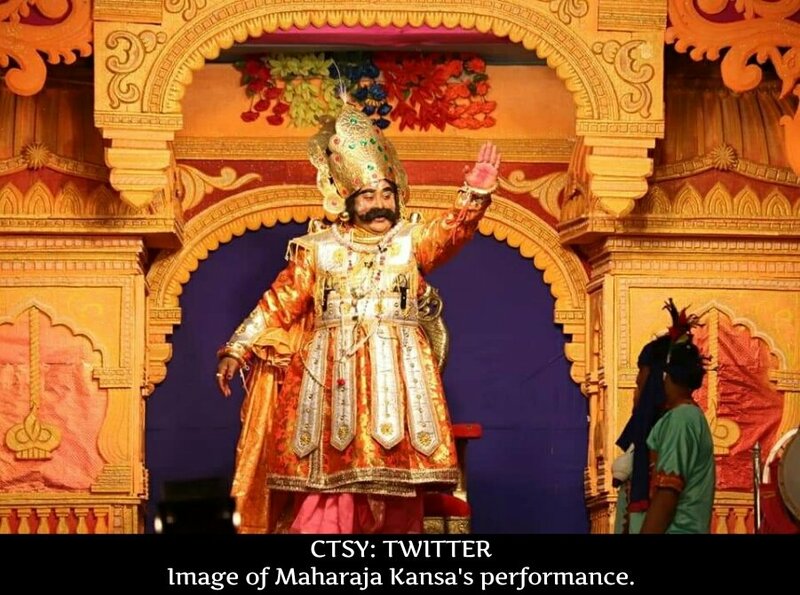 Unlike the unmitigated villain that Kansa is portrayed as in mythology, King Kansa in Dhanu Yatra is a benevolent emperor who genuinely cares for his people and kingdom. Wherever his royal procession goes, the people on the street play along and they all get a role to play. All people join in without any persuasion or invitation. Though the directions and fines imposed by King Kansa are not legally binding, they accept it as marks of obedience. People pay the token monetary fines and are even ready to undergo mild punishment. Kansa Maharaja sits on an elephant and tours the city all through the eleven days in the afternoon to take stock of the situation and to address his subjects’ grievances. He even summons government representatives like the District Magistrate, Police Superintendent, Ministers and senior political leaders to school them in the art of governance and public administration and directs them (albeit in a lighter vein) to redress his people’s suffering. He even fines and reprimands petty criminals and violators of law. They are subservient to the “king”, and they give accounts of the welfare works they have executed in the area. Usually, the directions of King Kansa carry a social message. 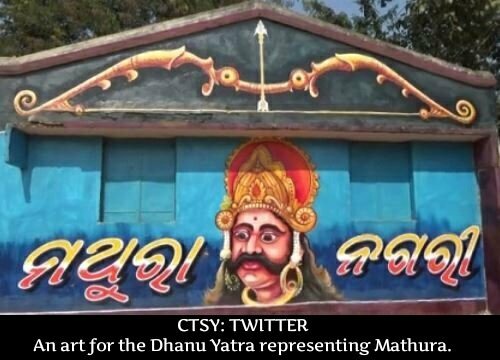 On the second day of the Dhanu Yatra this year, King Kansa hopped off from the elephant and entered an Odisha State Road Transport Corporation bus. He ordered the drivers not to drink alcohol while driving and exhorted passengers to protest against any illtreatment. The king slapped a fine of “two lakh gold coins” on the authorities for not keeping the bathrooms in the bus terminal clean. The penalty was, of course, in jest, but the message went through. “I have played many characters in dramas in my life. But the social recognition I get for playing King Kansa is beyond everything else. My fellow villagers call me Kansa Raja during the festival and even after that,” says 51 year old Bhubana in an interview. 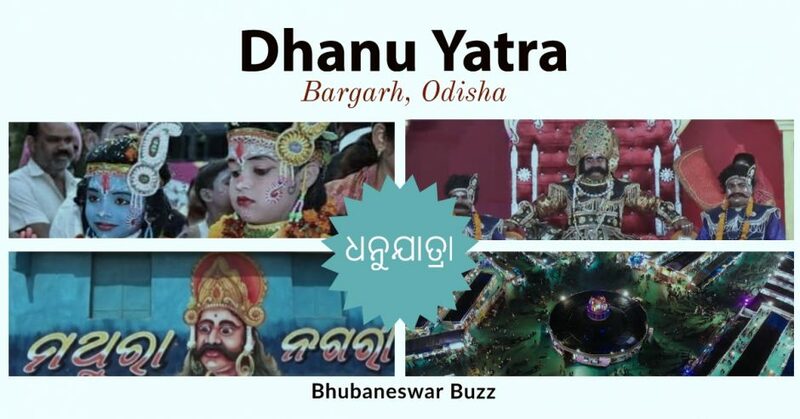 The myth of Dhanu Yatra is so intertwined with local culture and daily life that ‘Mathuranagari’ becomes the date line for almost all the vernacular dailies that report the event during the 11 days. The contour of the major events of the tale is always fixed, but the minute details and conversations between characters depend on the skill of individual artists and can be impromptu, evolving according to the situation; there is no written script or a designated director for the eleven-day long drama. Most of the action is impromptu and dialogues have been memorized by the actors by enacting their roles over the years. As many as 21 places such as ponds, temples, rivers, cultural and commercial centres become openair stages where the various episodes are enacted. Dhanu Yatra provides an opportunity for local performing artistes to showcase their talents. More than 3,000 folk singers and dancers as well as professional artistes from some 130 troupes perform during the 11 days. In reality, Bhubana, the tyrannical Kansa, is anything but an atheist. To wash away the ‘sins’ he commits during the Dhanu Yatra, he visits the holy town of Puri after the 11 days and takes a holy dip in the sea. He seeks forgiveness for all his blasphemous utterances against Krishna and Balaram during the festival. The Krishna Leela that is enacted during the Dhanu Yatra is not a mere theatrical performance by a bunch of artistes. It is so entrenched in people’sminds that it becomes almost real. And the community bonds get stronger during the festival. The Bargarh Dhanu Yatra is so big and famous that it features in the annual calendar of Odisha Tourism and attracts many foreign and inland tourists who visit Odisha to witness this grand event.